State Theatre Performances for Schools! State Theatre New Jersey is showing a whole generation of young people that exciting, entertaining, and unforgettable performances aren’t only to be found on their digital devices. Each season, about 15,000 students find out what it’s like to experience performing arts live onstage—to be in the same space as the performers, watching the show unfold in real time, with no pause or rewind. At the State Theatre’s Performances for Schools, they can see music, dance, and theater from around the world; this year’s lineup features shows from China, Japan, Australia, the UK, Switzerland, and Canada, as well as the U.S.
We know that field trips are a big deal for schools. Teachers have to get permission from parents, find the money for tickets and transportation, and make the case that the activity has educational value. At State Theatre, we do all we can to help. For one thing, we keep prices really, really low: just $8 per seat. Since we are a not-for-profit organization, we couldn’t offer these large subsidies to schools without the support of a lot of very generous donors who believe it’s important for kids to see high-quality live theater. A big thank you to all of them! Another way we help teachers get their students to the State Theatre is by making the all-important curriculum connections. For every show, we provide detailed study and activity guides, called Keynotes. There’s lots of detailed information, creative ideas for using the show as a discussion-starter, and activities connecting the performance to language arts, social studies, science, and other areas of the curriculum. We make sure our Performances for Schools series has something for teachers of every grade level and subject. 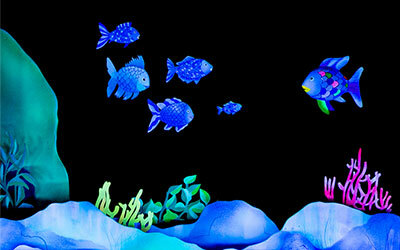 If you’re a preschool teacher, it’s a pretty safe bet that you teach Marcus Pfister’s The Rainbow Fish. Make a magical story more magical still by bringing your students to Mermaid Theatre’s adorable stage version, coming in April. Another classic children’s book that will be coming to life on the State Theatre stage is The Gruffalo by Julia Donaldson and Axel Scheffler. Children will love to watch brave Mouse outsmart wily Fox, eccentric old Owl, and party-mad Snake… and maybe even a hungry Gruffalo. This merry menagerie will be here this February. Just about every student has to read Shakespeare at some point. But of course, he wrote his plays to be seen and heard, not read from the page. In March, middle and high school students can see a raw, riveting performance of Macbeth from the Stratford Festival in Canada, broadcast in stunning HD on the State Theatre’s ginormous screen. You science teachers out there… Yes, you. We have a great show for you, too. It’s called ERTH’s Dinosaur Zoo. 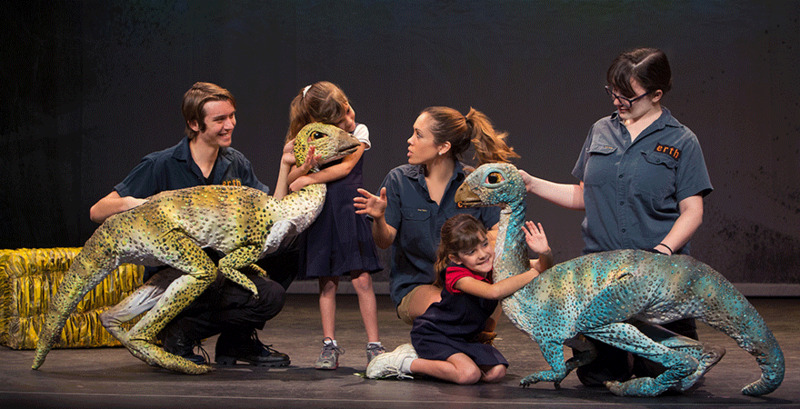 You and your students will feel like you’ve stepped into Jurassic Park—the dinosaurs in this show are THAT real. T-Rex and his friends will be taking over the State Theatre in March. And for music students of all ages, straight from Japan comes TAO: Drum Heart. This Japanese taiko drumming ensemble brings contemporary Broadway flair to a time-honored musical tradition and expands students cultural understanding. Want to learn more about State Theatre New Jersey’s Performances for Schools? Contact our Education & Outreach Department at education@stnj.org / 732-247-7200, ext. 545. Performances for Schools are sponsored by M&T Bank.